The Airmax™ Nasal Device is designed and clinically proven to increase airflow through the nose, providing a simple and effective solution for individuals who have difficulties breathing while sleeping or as a result of colds and allergies. Results of a recent study show that consumers preferred the Airmax™ over other nasal device alternatives. 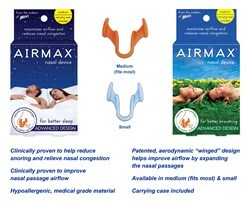 McKeon Products, Inc. is proud to introduce the new Airmax™ Nasal Device. 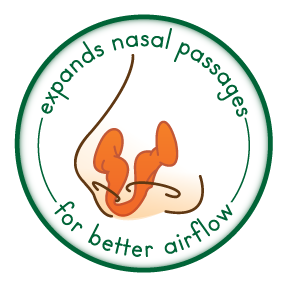 The Airmax™ Nasal Device is a clinically proven endonasal (inside the nasal passage) medical device that increases airflow through the nose, providing a simple and effective solution for individuals who have difficulties breathing while sleeping or as a result of colds and allergies. The Airmax™ Nasal Device is different from other nasal devices on the market, as it expands the narrowest parts of the nasal channel allowing maximum airflow. Multiple clinical studies have proven its effectiveness in improving airflow, reducing snoring, and reducing mild sleep apnea. Additionally, the results of a recent study show that consumers preferred the Airmax™ over other nasal device alternatives. The Airmax™ Nasal Device is important in helping consumers address nasal breathing difficulties and sleep challenges. The negative effects of habitual snoring can put people at risk for serious health problems, including obstructive sleep apnea, which can also put undue strain on the heart. In general, lack of quality sleep can lead to drowsiness during the day and can interfere with quality of life. Since 1962, McKeon Products, Inc. has led the retail ear care industry with its original and #1-selling Mack’s® Pillow Soft® silicone ear plugs. Mack’s® is the #1 doctor recommended ear plug brand in the U.S., with a variety of products designed for sleep, travel, music, swimming and overall noise reduction. Mack’s® is also the #1-selling brand of ear plugs and the official ear care line of USA Swimming. Today, McKeon manufactures a full range of moldable and pre-molded silicone and foam earplugs for all your hearing protection needs. The Mack’s® line of products also includes ear drying aids, earwax removal aids, sleep masks, ear muffs, and screen and lens wipes. McKeon, an ISO 9001:2008 quality certified company, is committed to supplying the highest quality, innovative products at the lowest possible price. Recently, McKeon launched their new free ear plugs giveaway. Visitors to http://www.macksearplugs.com can sign up to receive a sample of Mack’s® Ear Plugs. Protect your hearing and improve your health; get your free ear plugs sample from Mack’s® today!